Bladder cancer in women is increasing in numbers but the cause of it is still not determined. Many are not even aware of what actually bladder cancer is. The bladder is an organ which stores urine which is produced by the kidneys. The cells in the bladder may undergo a transformation and become abnormal and multiply and grow without normal controls. When the cells multiply, they form abnormal cells which are called tumor. There are many factors associated with bladder cancer as they may play a role and contribute in causing it and one of them is smoking. Women smokers face a higher risk of bladder cancer that points to the changing content of cigarettes as a potential reason of increase of the risk. There is increased percentage of harmful content in the cigarette that increasingly increases the risk of cancer. According to the latest estimate, smoking is the cause for half of the cancer cases in women compared to earlier tobacco use. Nowadays, the number of men and women of the US population who smoke is likely to be the same and the changes in the cigarette seem to be a reduction in tar and nicotine concentration but increase in the concentration of specific carcinogens including beta-napthylamine known as a bladder carcinogen. The percentage of smoking women has risen to 52% it is estimated that about 69,250 people will be diagnosed with bladder cancer this year in the United States, and 14,990 will die from the disease, which is the top medical news. As the definite cause for bladder cancer is not yet determined, numbers of carcinogens have been identified as the potential causes. 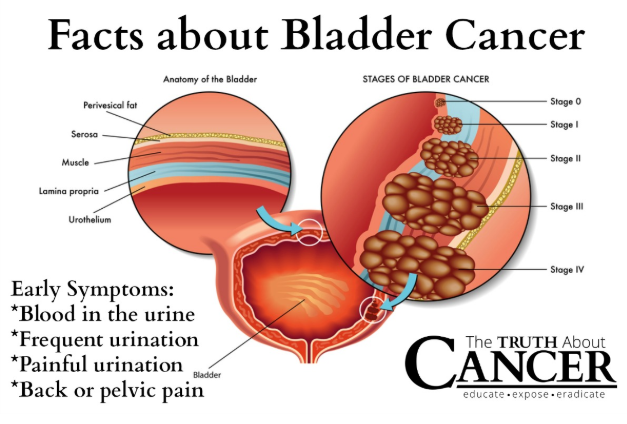 However, there are some factors which definitely increase the risk of bladder cancer. Chemical exposure is a very big factor and particularly organic chemicals called aromatic amines, linked to the dye industry, are potential risk factors. Other industries linked to such risk are hair coloring, printing, rubber and leather processing and paints. In relation to food, the diet including animal fats and fried meats pose to be a higher risk. Also, a herb called aristolochia fangchi used as dietary supplements contains chemicals that can cause cancer in rats and it is said that it can cause higher rates of blood cancer and kidney failure. All these above mentioned failures can be worked upon and checked while there are some factors which a person cannot help. The risk of bladder cancer increases with age and men are three times more likely than women to have this disease. A history of bladder cancer in the past increases the risk. Frequent bladder stones, bladder infections and other urinary tract infections, generally known as squamous cell carcinoma, irritating the bladder, increase the risk of developing cancer. Sometimes, some people are born with an apparent or invisible defect that connects bladder with another organ in the abdomen or leaves it exposed to continual infection. This increases the bladder's vulnerability to cellular abnormalities that can lead to cancer. One should take care and be alert about all the causes related to bladder cancer.